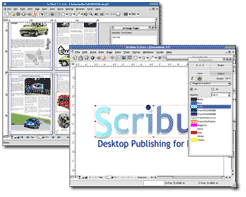 Scribus is an incredibly powerful Desktop Publishing program similar to Microsoft Publisher and Pagemaker. Unfortunately, it's power can seem a bit confusing and obfuscated to the novice user. In this series of audio / video screen captures, I create a newsletter for the Friends of the Majestic Maple Library from draft to PDF distribution. In this series, you'll learn how to use text and image areas, as well as stylesheets, and the powerful story editor. You'll learn about the preflight verifier, and will be able to create your own PDF documents from your Scribus creations. These videos are distributed in Theora format. Check out the list of supported players for additional information. (I highly recommend VLC for Windows users). The complete videos are mirrored at archive.org. These videos were created using recordmydesktop and Xnest.